ErgoCanada is a division of Micwil Group of Companies Ltd., a provincial corporation formed January 1st, 2008 and operating in Saskatoon, Saskatchewan. Our original company name was Micwil Computer Consulting which reflected our original business model which was to provide dedicated computer sales, service, upgrades, training and troubleshooting. Our commitment to a high level of customer service and belief in personalized customer service for every client was always an integral component of our business philosophy. As Micwil Computer Consulting became more and more specialized in the area of ergonomics and ergonomic products, it was decided to form a new division exclusively dedicated to servicing our ergonomic customers. ErgoCanada.com was launched on March 1, 2000, providing an ergonomics portal for the company with a focus on ergonomic products for computer workstations. Our goal was (and continues to be) to work collaboratively with ergonomic professionals, corporate clients and consumers to provide not just a mean to purchase ergonomic products in Canada but also provide an objective source for information on those products (independent of the manufacturers). Our range of ergonomic products is one of the most comprehensive on the web, and provides detailed technical specifications on every product, allowing visitors to research potential product choices to determine which is right for them. In consultation with ergonomics professionals and their clients, we continue to expand our understanding of applications for ergonomics products and their relative effectiveness at meeting specific goals. One of the most difficult challenges facing an ergonomic professional or one of their clients looking for ergonomic products is finding a single source where the products can be compared and obtained at a reasonable cost. Our goal is to continually increase our range of products to ensure that we offer any product available anywhere in the world at a reasonable price. We want to be the only place Canadians need to shop for ergonomic products. We work in conjunction with ergonomic professionals to provide relevant information to improve their on-site assessments, and refer our clients to our Ergonomic Professional Locator Service if they wish an on-site evaluation of their needs. If you would like more information, you can read our Mission Statement. We also act as a Canadian representative for specialty input device and ergonomic accessory manufacturers, providing them with a fulfillment solution (i.e. distribution throughout Canada) in addition to acting as a technical support centre, manufacturer representative, warranty depot and customer service centre for their Canadian customers. If you are a manufacturer and would like more information, please see our Corporate Site. Unlike many companies who have abandoned the 'bricks and mortar' model, we have made a conscious decision to not be known only as a virtual entity in cyberspace. At right you can see a picture of ErgoCanada's current office / warehouse complex in Saskatoon. We have a large showroom allowing us to display our products in addition to offices for all our staff and of course our large warehouse in which we typically keep enough product to meet the demand of our customers for a 3 - 6 month period. 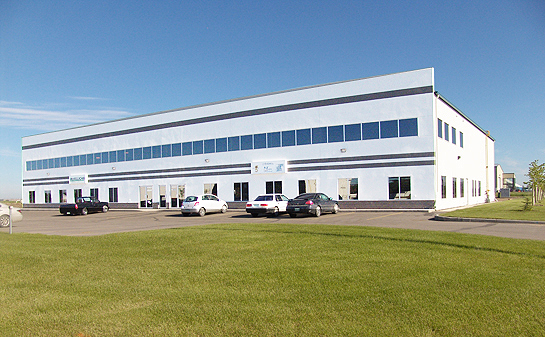 The Micwil Building (pictured below) is at 102 Wheeler Street in Saskatoon, in the new commercial area north of the Silverwood golf course. Please call for an appointment to visit our showroom. Rather than adopting the increasingly prevalent 'just in time' approach to stocking product, we believe in stocking products 'just in case'. Often with small specialty manufacturers there will be production issues or delays which can result in supply issues. We insulate our customers from the 'vaguaries' of production by maintaining enough stock to carry us through temporary shortages that the manufacturer may experience. When it comes to ergonomic products, often timing is essential as individuals are unable to work (or return to work) without the needed products which is why we keep all our products in stock in our Saskatoon warehouse, allowing us to offer next day delivery when needed to most of Canada. This ensures that a lack of availability of product should never create as an impediment to the successful implementation of your personal or corporate ergonomics program. Michael Craggs, BA, LLB is the President and founder of Micwil Group of Companies Ltd. He has degrees in Economics, Political Studies and Law, and has been involved in the computer industry since 1989. His decades of experience in the computer industry and over a decade of experience in handling ergonomic computing products have given him excellent knowledge of the effectiveness and applications of various devices. In addition he has contributed to the design and development of several ergonomic products and provides ongoing guidance to manufacturers to improve and enhance current product lines. He has been interviewed for various publications and media, and is often asked to speak at conferences and meetings on the topic of ergonomic products and the ergonomics industry. ErgoCanada has a number of dedicated full time employees who work in various capacities in the organization to ensure that we can provide potential customers with objective information and product analysis. We know how to ask the 'right' questions of customers in order to help identify the ergonomic product (if any) which has the best chance of meeting the expectations of each customer. Our entire staff from the front-line Customer Service Specialists to the more experienced Product Specialists are here to ensure that products are compared, presented and considered fairly. Drawing upon our anecdotal experience with literally tens of thousands of product deployments over the years allows us to filter out perceived ergonomic features from actual ergonomic benefits. If a full ergonomic assessment is desired, please refer to our EPL Service. Do you think you have the skills, talent and experience to become a productive and integral member of the ErgoCanada team? Contact us - we are hiring!